Dimitri Payet inspired a West Ham comeback to secure victory over Bournemouth which moves them to fifth in the Premier League. Harry Arter had given the hosts the lead with a 25-yard strike. But West Ham were much improved after the break thanks to the inventive Payet who deservedly scored a wonderful free-kick into the top left corner. Payet then fed Enner Valencia for a tap-in before the Ecuadorian produced a stunning free-kick late on. With Manchester United drawing 3-3 at Newcastle, the victory for Slaven Bilic's men - which seemed unlikely at the break - moves the Londoners to within a point of Tottenham in fourth. The win, West Ham's first away from home in six games, also equals a club record eight-match unbeaten run in the Premier League. How the action unfolded at the Vitality Stadium. Bournemouth deserved their lead at the break, but West Ham immediately played with more intensity in the second half and, such is their character, have now secured eight points in the league this season from losing positions, a haul only Leicester, with 10 points, can better. The Hammers have had to cope with injures to key players in recent months - Andy Carroll being the latest injury worry after lasting just 12 minutes of this match - but Payet's recovery from an ankle problem is a much welcome boost for the Londoners. Making his first Premier League start since 7 November, the Frenchman orchestrated West Ham's comeback. His free-kick was sublime, while it was his skill inside the box which created the second goal. "It's scary how good he is. He's a top player. 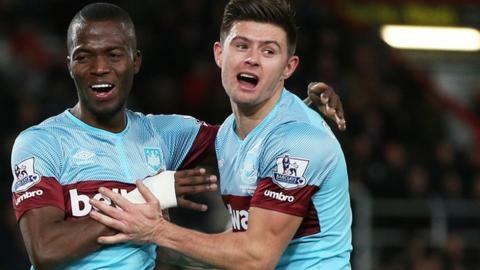 He's a player who makes all the others better," said manager Slaven Bilic after the match. "It's all about the team, but he's the player who is the most decisive for us." Bournemouth's club-record signing Benik Afobe started for the Cherries following the striker's £9m move from Championship side Wolves. Boss Eddie Howe had warned before the match not to expect too much from the new signing, to allow him to adjust to the pace of the Premier League. But the former Arsenal striker should have done better with the chances created for him in the first half. With the hosts in command, the 22-year-old - who scored 23 goals in 48 games for Wolves - failed to hit the target with a header from six yards out and then messed up another scoring opportunity, hesitating to allow Adrian to gather on the floor after being put through by a wonderful Junior Stanislas pass. Howe reflected on the positives, saying: "The pleasing thing was that he was at the end of those chances and we know with his quality he'll put them away." Scoring has been a problem for the Cherries, which is why they have spent about £16m on strikers in the past week, with Lewis Grabban re-signing for about £7m on Monday. Howe also said further additions will be made to the squad this month. And although Afobe should have been more clinical, Arter's strike did at least ensure Howe's side scored for the first time in four league matches. Harry Arter scored his first-ever Premier League goal in his 11th appearance in the top-flight. A league-high 26% of the Cherries' Premier League goals have come from outside the box (6 of 23). Eddie Howe's side scored for the first time in their last four top-flight games, thus ending their longest PL drought of the campaign (3 games). Dimitri Payet has scored or assisted more goals for West Ham this season (all competitions) than any other player (six goals, five assists). Bournemouth have thrown away a joint-league-high 12 points from leading positions this season in the Premier League (along with Newcastle United). West Ham face relegation-threatened Newcastle at St James' Park on 16 January, while Bournemouth - just three points from relegation - face fellow strugglers Norwich at home (16 January) and Sunderland (23 January) in successive league matches. Match ends, Bournemouth 1, West Ham United 3. Second Half ends, Bournemouth 1, West Ham United 3. Attempt missed. Adam Smith (Bournemouth) right footed shot from outside the box is high and wide to the left. Assisted by Juan Iturbe. Attempt saved. Juan Iturbe (Bournemouth) left footed shot from outside the box is saved in the bottom left corner. Assisted by Adam Smith. Corner, Bournemouth. Conceded by Michail Antonio. Goal! Bournemouth 1, West Ham United 3. Enner Valencia (West Ham United) from a free kick with a right footed shot to the top left corner. Attempt blocked. Junior Stanislas (Bournemouth) right footed shot from outside the box is blocked. Assisted by Charlie Daniels. Substitution, Bournemouth. Glenn Murray replaces Harry Arter. Substitution, West Ham United. Alexandre Song replaces Dimitri Payet. Goal! Bournemouth 1, West Ham United 2. Enner Valencia (West Ham United) right footed shot from the centre of the box to the high centre of the goal. Assisted by Dimitri Payet. Substitution, Bournemouth. Lewis Grabban replaces Benik Afobe. Dimitri Payet (West Ham United) is shown the yellow card for excessive celebration. Goal! Bournemouth 1, West Ham United 1. Dimitri Payet (West Ham United) from a free kick with a right footed shot to the top left corner. Attempt saved. Dan Gosling (Bournemouth) right footed shot from outside the box is saved in the top centre of the goal. Assisted by Harry Arter. Corner, West Ham United. Conceded by Juan Iturbe. Substitution, West Ham United. Carl Jenkinson replaces James Tomkins. Attempt missed. Enner Valencia (West Ham United) right footed shot from outside the box is high and wide to the right. Attempt missed. Harry Arter (Bournemouth) left footed shot from the centre of the box misses to the right. Attempt blocked. Harry Arter (Bournemouth) right footed shot from outside the box is blocked. Assisted by Andrew Surman. Attempt blocked. Mark Noble (West Ham United) right footed shot from outside the box is blocked. Assisted by Dimitri Payet.